Rare-earth permanent magnets are widely used in the accelerators of charged particles. However, the magnetic performance under irradiation remains a key issue for the most high energy applications such as accelerators with the energy up to 10 MeV. The aim of the work was to assess radiation and magnetic stability of Sm-Co and Nd-Fe-B permanent magnets under the direct electron irradiation with the energy of 10 MeV and bremsstrahlung. Sm-Co and Nd-Fe-B permanent magnets were produced by powder metallurgy method including PLP for the latter. The absorbed dose imposed by electron beam was 16 Grad (the total flux of electron per 1 cm2 was 1.4х1017) and 160 Grad. The radiation activity of both Nd-Fe-B and Sm-Co magnets was within the acceptable limits after the irradiation. This makes rare-earth magnetic materials suitable for such applications. In order to avoid overheating during electron irradiation, magnets were cooled with the water (T=38 °С). In order to estimate the changes in magnetic flux, the integral of the 3D interpolation normal component of magnetic flux was used. Calculated S parameter measured in arbitrary units was chosen as integrated z-component of magnetic flux. It was shown that magnetic flux of Nd-Fe-B magnets became 0.92 and 0.717 of initial values for 16 Grad and 160 Grad correspondingly, but the magnetic flux of Sm-Co magnets had no change to the same absorbed doses. Thus, Sm-Co magnets were chosen for simulating and designing magnetic system for electron beam analysis of a technological accelerator with energy up to 10 MeV. The distance between the poles of the magnet was 25.25 mm. The highest magnetic field inside the magnetic system was 0.3110 T. The effective distance was 33.53 mm. The measured parameters of the magnetic system based on Sm-Co magnets agreed with the simulation experiment. Magnetic system can also be used to adjust the accelerator in the energy range up to 10 MeV. Shvedunov V. I., et al., A 70 MeV Race-Track Microtron // Nucl. Instr. Meth. – 2005. – Vol. 550. – No. 1-2. – P. 39-53. David J. McLaughlin, Kenneth R. Hogstrom, Robert L. Carver, John P. Gibbons, Polad M. Shikhaliev, Kenneth L. Matthews II, Taylor Clarke, Alexander Henderson, and Edison P. Liang. Permanent-magnet energy spectrometer for electron beams from radio-therapy accelerators // Medical Physics. – 2015. – Vol. 42. – No. 9. – P. 5517- 5529. Bødker F Permanent magnets in accelerators can save energy, space and cost // Proc. of IPAC2013. - Shanghai, China, - 2013. – P. 3511-3513. Alex Bainbridge, Ben Shepherd, Norbert Collomb, Jim Clarke. Michele Modena The ZEPTO project: Tuneable permanent magnets for the next generation of high energy accelerators // Proc. 25th International Conference on Magnet Technology. - Amsterdam, 30th August 2017. TalkID#448, session Wed-Mo-Or19. Bovda А.М., Guk I.S., Dovbnya A.N., Kononenko S.G., Lyashchenko V.N., Mytsykov A.O. Dipole magnet with a constant field for the accelerator “EPOS” // Problems of Atomic Science and Technology. Series “Nuclear Physics Investigations” – 2015. – Vol. 100. – No. 6. – P. 13-17. Beloglasov V.I., Zykov A.I., Zlunitsyn E.S., Kramskoi G.D., Fursov G.L. An electron linac producing beam power up to 15 kW // Proceedings of the 1996 EPAC. – 1996. – Vol. 1. – P. 798-800. Ayzatsky N.I., Dovbnya A.N. et al. Accelerating system of the technological electron accelerator // Problems of atomic science and technology. Series “Nuclear Physics Investigations”. – 2012. – Vol. 80 – No 4. – P. 45-49. 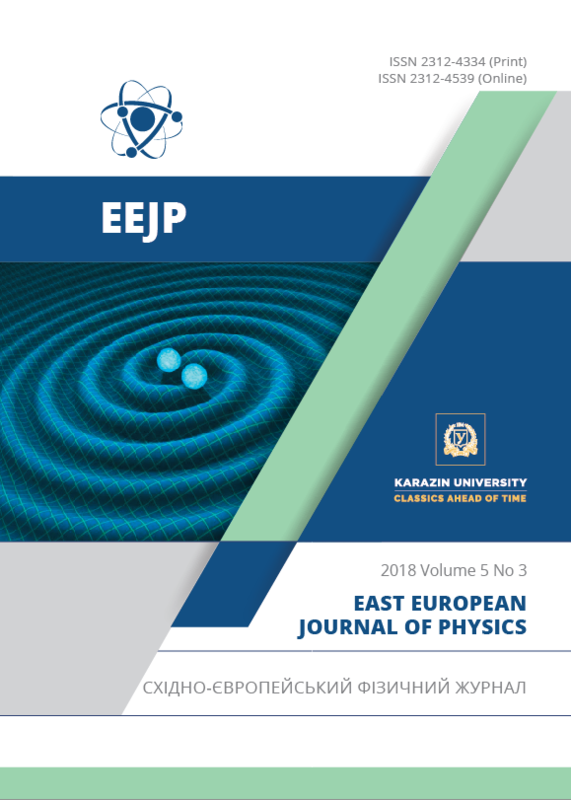 Dovbnya A., Guk I., Kononenko S., Tarasenko A. Beam transport system selection on the accelerator LU-10 // Problems of atomic science and technology. Series “Nuclear Physics Investigations”. – 2013. – Vol. 88 – No. 6. – P. 57-61. Guk I.S., Kononenko S.G., Lyashchenko V.N., Mytsykov A.O., Choice of parameters of the analyzing magnet for technological electron accelerator LU-10M // Problems of atomic science and technology. Series “Nuclear Physics Investigations”. – 2017. – Vol. 112. – No. 6. – P. 24-27. Okuda S., Ohashi K., Kobayashi N. Effects of electron beam and y-ray irradiation on the magnetic flux of Nd-Fe-B and Sm-Co permanent magnets // Nucl. Instr. Meth. – 1994. - Vol. B94. - P. 227-230. Luna H.B. et al. Bremsstrahlung radiation effects in rare earth permanent magnets // Nucl. Instr. Meth. – 1989. – Vol. 285. – No. 1. – P. 349-354. Alderman J. et al. Measurement of radiation-induced demagnetization of NdFeB permanent magnets // Nucl. Instr. Meth. – 2002. – Vol. 481(1-3). – P. 1-3. Dovbnya A. N. et al. Study on radiation resistance of permanent Nd-Fe-B-base magnets under continuous radiation conditions // Problems of Atomic Science and Technology. Series “Nuclear Physics Investigations”. – 1999. – Vol. 34. – No. 3. – P. 48-49. Bizen T. et al. Demagnetization of undulator magnets irradiated high energy electrons // Nucl. Instr. Meth. – 2001. – Vol. 467. – P. 185-189. Bizen T. et al. High-energy electron irradiation of NdFeB permanent magnets: Dependence of radiation damage on the electron energy // Nucl. Instr. Meth. – 2007. – Vol. 574. – No. 3. – P. 401-406. Qiu R. et al. Radiation damage of Nd2Fe14B permanent magnets at 2.5 GeV electron accelerator // Nucl. Instr. Meth. – 2008. – Vol. 594. – No. 2. – P. 111-118. Gao R.S., et al. Study of γ -ray irradiation effect on permanent magnets // J. Appl. Phys. – 2008. – Vol. 103. – P. 103-105. Ikeda T., Okuda S. Magnetic flux loss of the permanent magnets used for the wigglers of FELs by the irradiation with high-energy electrons or X-rays // Nucl. Instr. Meth. – 1998. – Vol. 407. – No. 1-3. – P. 439-442. Simos N. et al. An experimental study of radiation-induced demagnetization of insertion device permanent magnets // Proc. EPAC 2008, Genoa, Italy. – 2008. – P. 2112-2114. Vagin P., Bilani O., Schöps A., Tripathi S., Vielitz T., Tischer M. Radiation damage of undulators at PETRA III // Proc. IPAC2014, Dresden, Germany. – 2014. – P. 2019-2021. Rui Qiu, Hee-Seock Lee, Junli Li, Tae-Yeong Koo, T. Bizen & Qiyong Fan. Demagnetization of Nd-Fe-B permanent magnet at 2.5 GeV electron accelerator // Journal of Nuclear Science and Technology. – 2008. – Vol. 45. – P. 46-49. Bizen T., Asano Y., Maréchal X.–M. SPring-8. Irradiation Experiments and Magnet Protection Plans at SPring-8 // IEEE Editorial Style Manual, IEEE Periodicals, Piscataway, NJ, USA. – Oct. 2014. – P. 34-52. Bizen T. Brief review of the approaches to elucidate the mechanism of the radiation-induced demagnetization // Proc. ERL2011, Tsukuba, Japan. – 2011. – P. 121-126. Bovda V.A. et al. Magnetic field losses in Nd-Fe-B magnets under 10 MeV electron irradiation // Problems of Atomic Science and Technology. Series “Nuclear Physics Investigations”. – 2017. – Vol. 109. – No. 3. – P. 90-94. Bovda А.М. et al. Magnetic properties of Sm2Co17 magnets under 10 MeV electron beam // Problems of Atomic Science and Technology. Series “Nuclear Physics Investigations”. – 2017. – Vol. 112. – No. 6. – P. 162-166. Bovda V.A., Bovda А.М., Guk I.S., Dovbnya A.N., Kononenko S.G., Lyashchenko V.N., Mytsykov A.O., Onischenko L.V. Dipole Magnet With A Permanent Magnetic Field For Technological Electron Accelerator // Proceedings of the REPM 2016, Darmstadt, Germany. – 28 August – 1 September 2016. – P. 481-487.